Two days after Special Counsel Robert Mueller filed the report on his investigation into Russian interference in the 2016 presidential election to the attorney general, William Barr provided a four-page summary to Congress and the public. Mr Barr writes that the special counsel's 22-month inquiry involved 40 government investigators issuing more than 2,800 subpoenas and 500 search warrants questioning around 500 witnesses. What was the end result? Here are some key lines from the attorney general's letter and what they mean. Most of Mr Barr's letter to Congress summarising the special counsel's investigation was in the attorney general's own words. In this instance, however, he chose to directly quote Mr Mueller's report. He clearly didn't want any misunderstanding about the investigation's conclusions. When Deputy Attorney General Rod Rosenstein appointed Mr Mueller as special counsel, he instructed the former FBI director to look for "any links and/or coordination between the Russian government and individuals associated with the campaign of President Donald Trump". On Sunday, in those 23 words, the special counsel provided his answer. Some will point to the words "did not establish" in that sentence and note that it doesn't mean the investigation found no evidence at all or that "collusion" didn't actually take place. Perhaps it isn't the "complete and total exoneration" that Mr Trump is claiming. When it comes to the language used in these type of investigations, however, it's as close as it going to get. "As noted above, the Special Counsel did not find that the Trump campaign, or anyone associated with it, conspired or coordinated with the Russian government in these efforts, despite multiple offers from Russian-affiliated individuals to assist the Trump campaign." This is probably a reference to the June 2016 Trump Tower meeting between Donald Trump Jr, senior campaign officials and Russians with ties to the Kremlin. It also might include Russian contacts by more tangential campaign aides such as George Papadopoulos and Carter Page or, perhaps, former Trump adviser Roger Stone's attempts to contact Wikileaks to find out about hacked Democratic emails. The details aren't provided, but the gist of what Mr Barr is saying is that while there was Russian outreach, there is no evidence that anyone from the Trump campaign took the bait. Russian interference in the 2016 presidential election was only one component of Mr Mueller's special counsel work. He also looked into whether the president violated the law by obstructing the investigation. And instead of making a prosecutorial judgement, the former FBI director punted. "While this report does not conclude that the President committed a crime,"it also does not exonerate him," wrote Mr Barr, quoting the report. Noting "difficult issues" involved in the determination of the president's conduct, Mr Mueller presents both sides of the argument for charging the president with the crime of obstruction of justices. He then leaves it up to the attorney general to make the call. "In cataloguing the President's actions, many of which took place in public view, the report identifies no actions that, in our judgment, constitute obstructive conduct, had a nexus to a pending or contemplated proceeding, and were done with corrupt intent ..."
With the ball firmly in his court, Mr Barr - nominated to the job of attorney general by Mr Trump in December - decided Mr Trump would not be charged with obstruction of justice. Central to the attorney general's conclusion was the fact that the special counsel found no "underlying crime" of conspiracy with the Russians to interfere with the 2016 election. There has been an ongoing debate in legal circles on whether obstruction of justice can take place without evidence of a crime to investigate, and Mr Barr comes down solidly, if not entirely, on the "no" side. While Mr Trump made plenty of public statements that could be construed as an attempt to influence the investigation, it appears Mr Barr concluded that they were not done with "corrupt intent". The attorney general made sure to note that this decision was made in consultation with Mr Rosenstein, who had appointed Mr Mueller back in 2017, as well as other Justice Department lawyers. This was a judgement call - and Mr Barr will take heat for it from the president's critics. He clearly wanted to make sure he wasn't alone in the spotlight. "My goal and intent is to release as much of the Special Counsel's report as I can consistent with applicable law, regulations and Departmental policies." 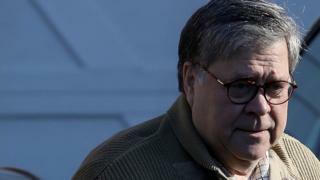 Mr Barr insists he will release as much of the report as he can, given rules that limit the disclosure of grand jury activities and information that could impact upon ongoing criminal proceedings. Democrats will be interested in learning of any more details unearthed in the Russia investigation, even if Mr Mueller did not conclude that there was sufficient evidence to prove conspiracy or coordination. In addition, they will want to see the pro-and-con arguments the special counsel made as it weighed charging Mr Trump with obstruction of justice. That's when the second-guessing of Mr Barr's decision will begin in earnest. All this, however, is going to take time. Meanwhile, Republicans - from the president down - will use Mr Barr's summary to argue that all the investigations into the president's conduct are baseless and should be abandoned. "This should be a lesson to my Democrat colleagues that chasing imagined scandals and following a partisan investigatory agenda will not result in any meaningful change for the country," writes Republican House Minority Leader Kevin McCarthy. There are a variety of ongoing investigations into Mr Trump's conduct and that of his businesses. Several of them pose a legitimate threat to the president, both legal and political. Those inquiries will continue unabated. On Sunday, however, Mr Trump's side landed a powerful talking point to use in the political warfare to come.